In business to take issue with that historically cleverly cloaked, insidious creeping malevolence which has led so many newer listeners astray; to perpetuate the standards set by our illustrious predecessors and pave the way for our successors, thereby... "standing for something rather than falling for anything". Much acknowledgement and respect I have for my principal teachers; "Sharpnack Street Ray", Mr. George Elias Lockhardt II, The late Dr. J. R. Mitchell, Mr. Silas Kinsey, the late Ms. Edith Willard, the late Mr. Adnan Barakat, Lloyd Courtney and Mr. Warren McLendon. 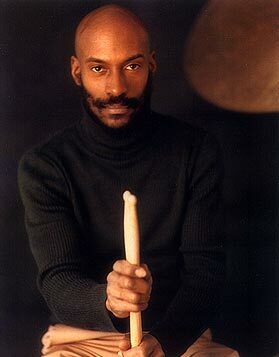 Since my Philadelphia Pennsylvania youth, I have often had the pleasure of playing drums on stage in either an ensemble or orchestral setting before literally thousands of people, performing music with Stanley Clarke, Michael Brecker, Wayne Shorter, Freddie Hubbard, McCoy Tyner, Wallace Roney, Gary Bartz, Ravi Coltrane, Weather Report, John Scofield, Albert Ayler, Don Ayler, Yuri Kageyama, Roberta Flack, Sonny Fortune, Bill Frisell, Woddy Shaw, Derrick Trucks, Roy Hargrove, Bobby Hutcherson, Jackie McLean, Charles Mingus, Donald Byrd, Carlos 'Patato' Valdez, Ladjii Cammara, Booker Irvin, Pharoah Saunders, James Moody, Kenny Dorham, Blue Mitchell, Hank Mobley, Harold Wheeler, Tony Hymas, Donny Hathaway, Paquito D'Rivera, Hino Terumasa, Andrew N. White III, The Milwaukee Symphony, Jimmy Heath, Sam Rivers, Khalid Yasin, George Mraz, Savion Glover, Kikuchi Masabumi Ishmael Reed, Yuri Kageyama, Isaku Kageyama, Kenny Endo and a host of other headline performers. 1967-1969; Directed full time music program for The New Thing Art & Architecture Center, Washington, D.C.
1967 - 1969; Co-Instructor for the African Heritage Dancers & Drummers, Washington, D.C.
1980 - Present; Private consultation and Instruction to five clients. 1980 - April 19th, 2001; (Middle Management) Helped the State of Minnesota teach convicted felons how to productively structure their time. To date, Ive lectured at The Georgetown Day School, Washington, D.C; Howard University, Washington D.C; Swarthmore College, Swarthmore Pennsylvania; University of Minnesota, Minneapolis, Minnesota; Kent State University, Kent, Ohio; Bennington College, Bennington, Vermont; Baruch City College, New York City, New York; Livingston College, New Brunswick, New Jersey; Antioch College, Yellow Springs, Ohio; The Childrens Theater Company, Minneapolis, Minnesota and the A.N. School of Contemporary Music, Tokyo & Los Angeles. Feature part in (then N.E.T. now P.B.S.) Special documentary film broadcast nationwide in March 1968 (viz., Color Us Black) ; McCutchen & Potter, producers. Having retired in 2001 at the rank of Lieutenant after a twenty-year career with The Minnesota Department Of Corrections, I have resumed my earlier involvement with professional music, often performing on tour with McCoy Tyner and more recenty with a group under my direction, Source Code, several very fine players, as I continue my commitment to a recording facility and small on going publishing concern, "1619 Music Company".